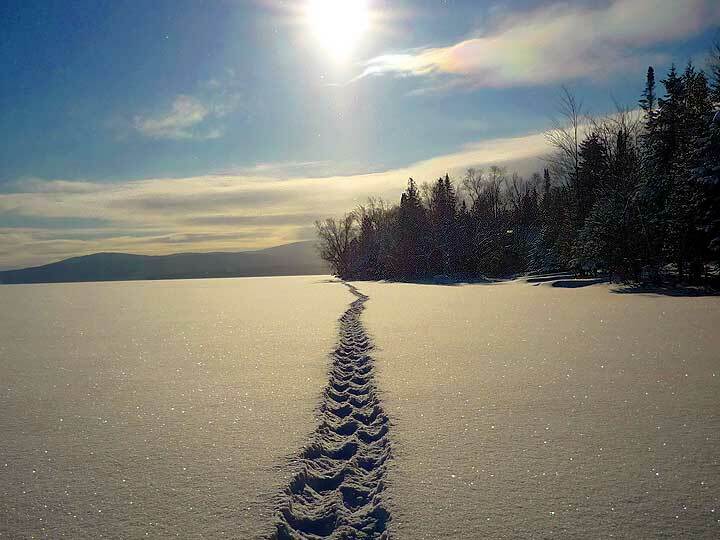 Snowshoeing on Rangeley Lake. Photo courtesy of Kevin Sinnett. The first snowfall in the Rangeley Lakes Region has the locals dusting off their winter sporting equipment and dreaming about that first plunge into fresh, white powder. In the Rangeley Lakes Region skiers and snowboarders head to Saddleback Mountain and Sugarloaf in the Carrabassett Valley to take a ride on the dedicated runs. Cross-country skiers and snowshoe enthusiasts also visit Sugarloaf and Saddleback to explore a bit of Maine wilderness or try out some of the trails in and around the Rangeley Lakes Trails Center. Maine Huts & Trails offers guided and self-guided cross-country skiing and snowshoeing excursions that include overnight stays at shelters known as huts. The Trails at Orgonon are a good bet as are the Rangeley Lakes Heritage Trust Trails that rim the western edge of Mooselookmeguntic and Cupsuptic. Part of the Appalachian Trail also runs through the Rangeley Lakes Region. If you’ve arrived without snowshoes a number of shops in Rangeley offer rentals. Climb on a sled pulled by a controlled pack of furry friends and do a bit of dog sledding at Rangeley Region Dogsled Adventures. If gliding across a frozen pond on a pair of skates is your pleasure head for the Big Rink at Outdoors Center in Sugarloaf or try out the Haley Pond Ice Skating Rink in Rangeley. You can pick up skates from Goalie Monkey. Slide down a snow covered hill on a sled, toboggan or perched on a bouncy inner tube. The rolling hills of the Mingo Hills Golf Course are a local favorite for family outings in the snow as is the Wilhelm Reich Museum at Orgonon. Visit in January and you might catch the annual Winter Carnival. If you like your snow adventures with a throaty “vroom-vroom” attached try a bit of snowmobiling. The Rangeley Snowmobile club and Flagstaff Lake Area’s Arnold Trail Snowmobile Club both have their own networks of trails to explore. The Black Fly Loop Snowmobile Trail offer 228 miles of snowboarding pleasure with the local loop running south of Rangeley Lake, through Oquossoc and looping around the north end of the region. There is no shortage of Rangeley Lakes Region winter celebrations and events. The Rangeley Snodeo, think rodeo but with snowmobiles taking the place of bucking broncos and ornery bulls, is a January staple. Monty the Moose, the Snodeo Mascot, oversees this family-friendly event. The Rangeley Lakes Loppet is an annual cross country ski marathon held in March. The Polar Bear Blast held jointly in Eustis and Stratton takes place the end of January into early February. This family outing features the Arnold Trail Snowmobile Club’s Radar Run, games with prizes, live music and evening fireworks. Each February Rangeley hosts the Pond Hockey Festival, playing the game al-fresco as it was when it was invented in the 19th century. Sugarloaf and Saddleback Resorts also have their share of races and events. Face it, winter in the Rangeley Lakes Region is all about fun.